It’s a rainy, chilly day here in PA, but this colorful engagement session will remind you that spring is around the corner. Greenhouses make me swoon! 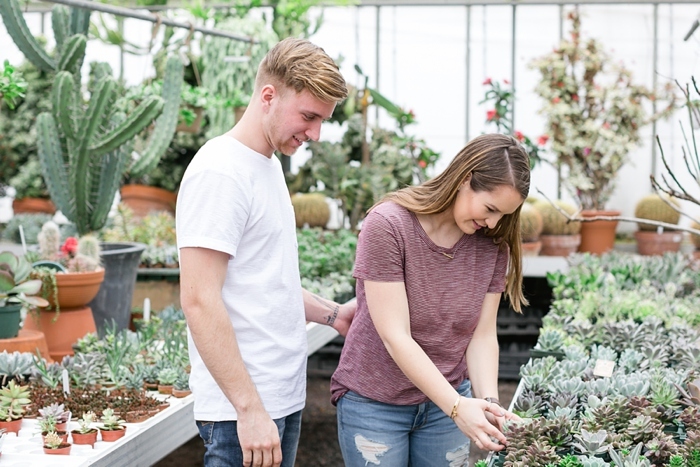 The colorful plants at Ott's Exotic Plants compliment the bubbly, happy personalities of Allison + Mandel! These two met in 2015 through a Spikeball club in Lancaster that her brother started. Several months later, Mandel asked Allison to be his partner in a tournament in New England. Around that time, they had their first date at Prince Street café over coffee. Shortly after they were officially dating, they had a blast going to a Spikeball tournament in California with friends. They recognized something special about each other. Earlier this year, Mandel planned a romantic proposal and asked her to be his wife. They celebrated that evening with both of their families and a “few friends” aka about 50 of their favorite people! Their June wedding will be such a joyous occasion, and I’m honored to capture it.